You are here: Home / DIY / 5 Easy Homemade Cleansers! When you are working toward staying in budget and saving money you quickly realize that basic household supplies play a huge part in where your money goes. 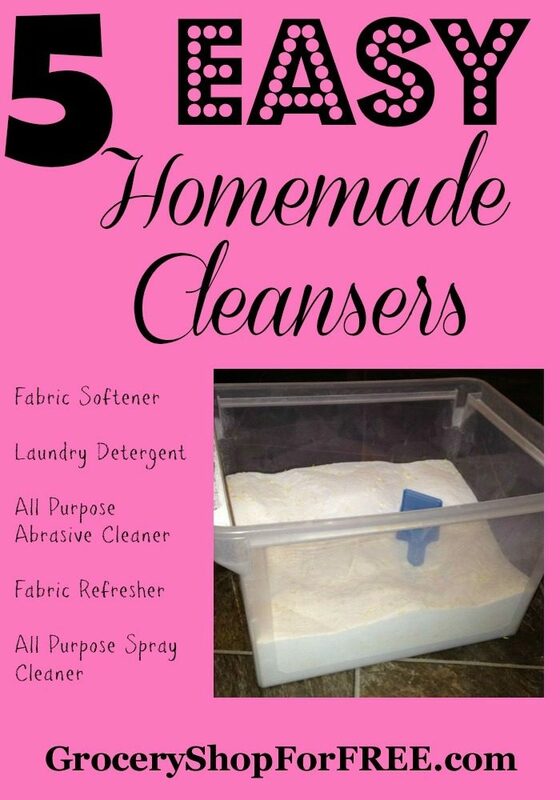 Here are 5 Easy Homemade Cleansers including the classic homemade powdered laundry detergent, an all purpose cleaner, fabric softener and even a stove top cleaner for counters, stoves and more. Directions: Grate Ivory and Fels Naptha soap with cheese grater. Pour into food processor or blender and pulse until fine powder. Mix together with washing soda and borax and store in an air tight container. Directions: Mix together to form a paste and scrub using scouring pad on surfaces like stove tops, bathtubs, sinks and counters with stains. Directions: Mix fabric softener and baking soda together in 32 oz bottle and fill with water. Gently shake to mix well. Spritz on fabric needing refreshing. *Will likely need to shake before each use to make sure contents have not settled. Directions: Heat 1 cup vinegar in microwave for 35 seconds (or until hot but not boiling). Mix 1 cup dawn dish soap with vinegar. Pour into spray bottle and top off with 1 cup water. Shake to mix well. Spray on counters, shower, tub, sinks, etc. Let sit for 3-5 minutes. Wipe off. The soap may cause suds so if preferred can rinse after with just water to get rid of any extra suds or soap film remaining. Supplies Needed: 1/2 Bottle Hair Conditioner (we use the FREE or cheapest kind in a fun “clean” scent), 2/3 cups White Vinegar, 4 Cups Hot Water. Directions: Heat water. Mix in conditioner whisking until well blended and no lumps remaining. Add vinegar and mix well. Pour into air tight container/jar. Use 1/4 cup per load of laundry. Can use in laundry “ball” if desired. As you can see these are all simple and inexpensive items to make. Not only do you cut back on the cost of your household supplies, but you are also able to make use of coupon deals and stockpile items like vinegar, dish soap and hair conditioner. These products are also great for those who have allergies or are concerned about what chemicals their kids and family are exposed to when cleaning. Make one or all of these 5 Easy Homemade Cleansers this week to help your dollar stretch farther this year.